This Excel-based electronic professional services billing and timesheet application records and calculates the hours worked by client, project and activity type. It differentiates between billable and non-billable hours. Billing values are calculated by activity, project and by client. Standard billing rate used as default can be overridden by a special billing rate for any specific task. Monthly and cumulative hours and billing values over the life of projects are analysed and charts, graphs and tables are produced. All reports feature drilldown and summarize facilities. All analysis can be segmented by department and employee. Analysis can be segmented by activity type and client. The template uses only standard Excel features and can be customized and extended within Excel. Records Employee name, Dept., Staff No., Date, Week No., and Standard Billing Rate. 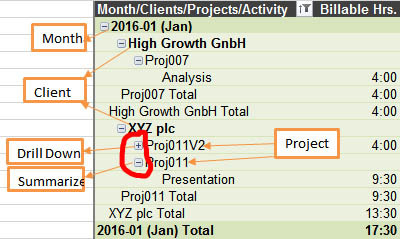 Records time worked by Date, Client, Project No., and Activity Code. Actual hours are calculated from start and end times entered. Time can be designated as billable (default) or non-billable. Billing values are calculated for all billable hours. Calculates and displays the Total Billable and Non-Billable Hours and Total Hours worked in the week. (2) a log where data for all employees can be entered. You get both versions! Facilitates signature and approval signoff. The weekly timesheet can be added to the cumulative project hours from previous weeks. A comprehensive range of reports and charts are then produced. Click on the images above to enlarge. Scroll down to check our customer product reviews below! All reports feature drilldown and summarize facilities as depicted here. All analysis can be further segmented by department and employee. If the features of the Excel Professional Services Billing template are not exactly what you need please contact us and we will see if we can meet your needs. Before purchasing, check out the Excel Billing Timesheet Templates for Professional Services / Projects User Guide for full details of the comprehensive list of features and the ease-of-use that allows you to get started right away! After much searching on-line for an affordable billing tracking solution, I came across The Business Tools Store. Their help in customizing the template for my exact needs was fabulous. Even with a considerable time zone difference (I'm in the US), they were prompt to respond and very patient with all my questions. I will definitely be purchasing more spreadsheets. This saved me so much time vs. me building from scratch. Kudos for a great product and stellar customer service! I was delighted to find that the timesheet template was a lot more than just the timesheet itself - great value in terms of the hours I would have had to spend just to set up even a basic version. Thanks to the team for their prompt help with my customisation queries - great service.